I recently read a post in a database forum where the questioner asserted that it wasn't possible to use an online forms app like Cognito Forms to capture multiple records for a database in a single form - using Zapier to take the form content and populating the database. I thought this was unlikely and in this post I am going to share how this is done. 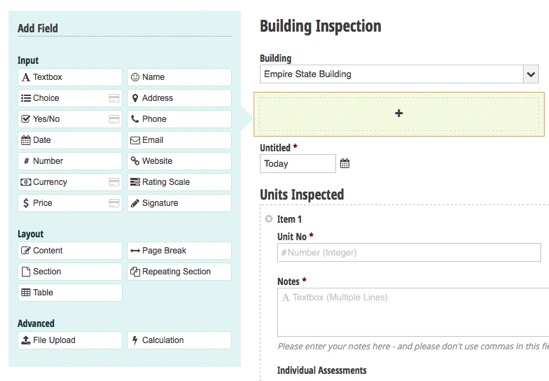 On the forum, the question related to capturing building inspections - inspecting apartment units - and then updating a database with the results of these inspections. 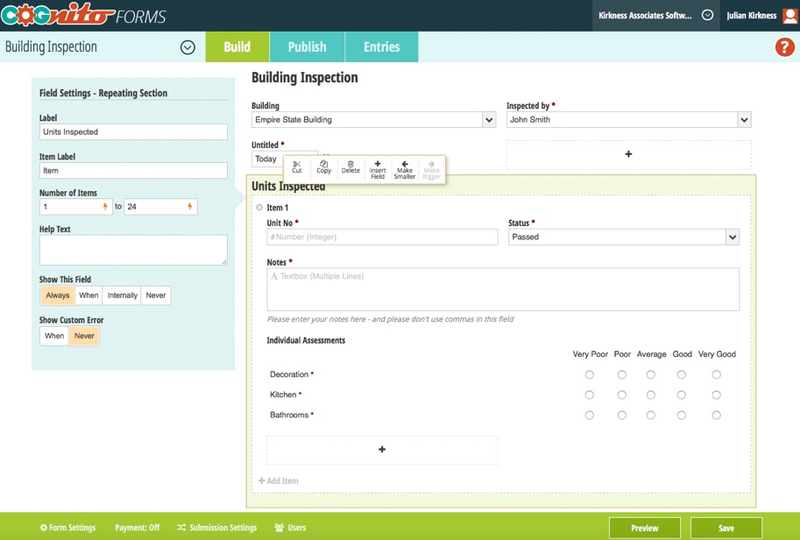 In order to show this, I have created databases in both Airtable and Knack, each with a Buildings table and an Inspections table. I am going to show how to take the values from a Cognito form with a repeating section for each unit and post these individually to each database (as you will see the process to post the new records is actually the same for each database). The hard work will happen in Zapier but let's start by having a look at the form. 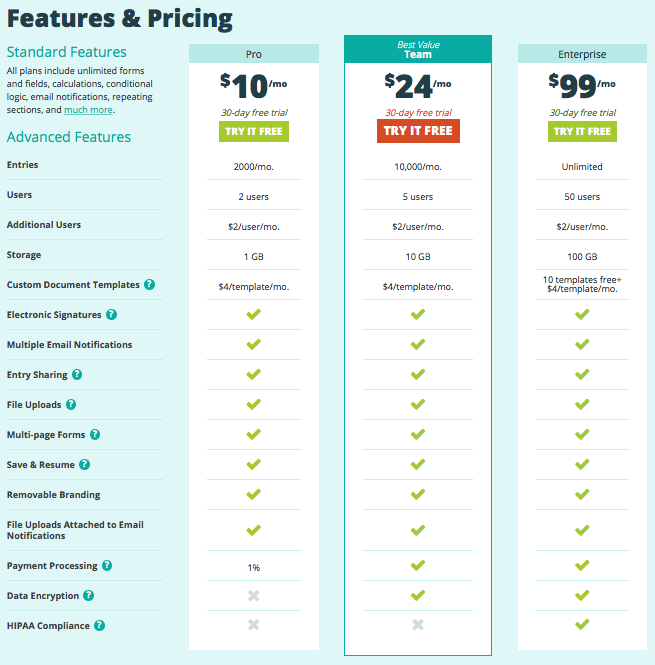 In this article, the features we will be using in Cognito are all available in the Free plan - however, I am using a Pro plan as it enables me to create forms with a digital signature, save and resume, etc. I'm using this to provide consultancy terms for clients which they can sign and slowly replacing other forms used to run my business. 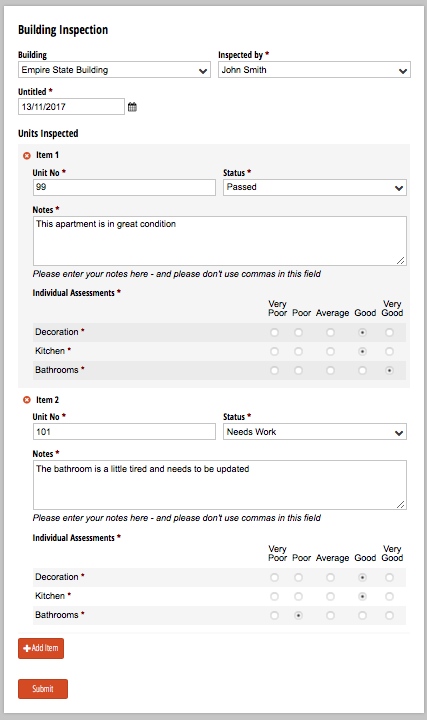 This particular form is pretty straightforward in that it simply has a few one time fields - Building, Inspector and Date and then a repeating section with six elements - a Unit number, overall Status and Notes followed by three rating levels for Decoration, Bathrooms and Kitchens. I have made all of the fields Required because otherwise the method of processing the values in Zapier would be much more difficult (or perhaps impossible) - and limited the repeating section to taking a maximum of 24 entries. This latter option is again due to Zapier - and I'll explain later on. Notice that you can have text content sections, page breaks, tables etc. - plus the repeating section used here. Once the form is complete, the next stage is to build the Zap. //steps will run for each record found. As it says in the comments, this code 'returns' an array of objects - in this case with just one value per object called record. Subsequent Zapier actions will then run for each 'object' in the array. The only thing to be aware of with this is that Zapier has a limit of 25 'objects' that it will cycle through in this way, which is why I limited the repeating section to only access 24 entries in the form definition above. This code also assumes that the triggering app (Cognito Forms in this case) will supply it's multi valued entries in a comma separated string - fortunately this is the case with Cognito with a comma separated string for each multi valued field. In preparing for this article, I discovered that Cognito will not include values for any field left empty - which is why I made all the fields in the form 'required'. All that's necessary here is to simply select the Form we are looking to 'pick up' (having set up a link to Cognito in Zapier)! The resulting output is an array of objects each containing 6 fields (itemOne, itemTwo, itemThree, itemBathroom, itemKitchen and itemDecoration). The first three field names are from a generic version of this code which I use regularly hence the generic names. Now all we need to do is to post these values to the relevant database - and in this example I am going to post them to both Knack and Airtable. 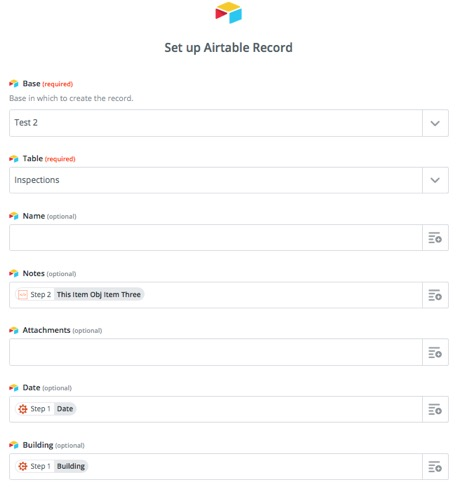 Airtable is a very different type of database, offering more of a collaborative approach with visual cues from the Spreadsheet. It can feel a lot more approachable - but each of these options are suitable for a range of projects. 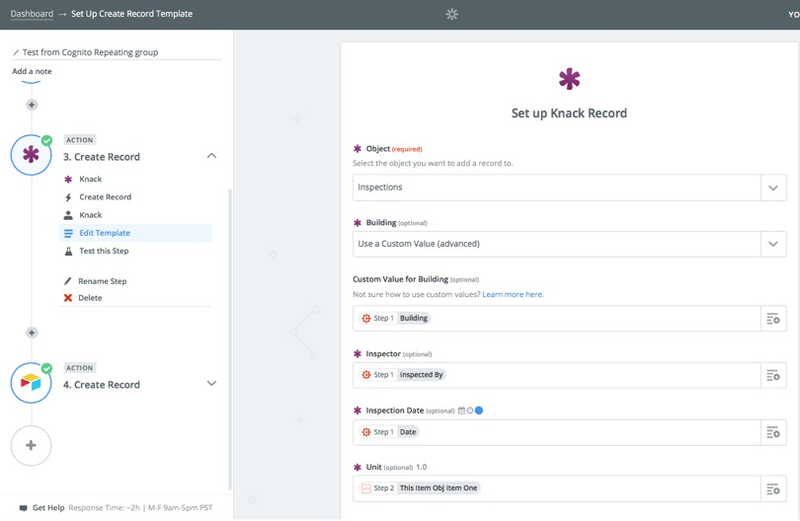 Airtable is visually very appealing - but Knack offers more granular security and allows the design of the database to be more protected. 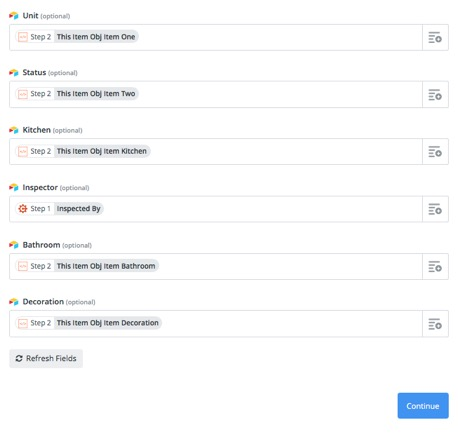 So we now have a complete process which takes multiple entries in a single Cognito form, processed it in Zapier and then posts it to two databases, Airtable and Knack. In the case of Knack, being more forms based than Airtable, it may be possible to achieve this inside an app - but specialist forms apps offer a lot of flexibility in design and flexibility that may be lacking in published database forms and so this technique may have many possible use-cases. If you'd like to find out more about Cognito Forms, click here. I hope you've found this useful - please feel free to comment!